My basement office has a few sound isolation features to reduce the disturbance of the small children running around upstairs. It gets hot without ventilation, so I would keep the door open, which totally defeated the purpose of sound isolation. I do have some windows to the outside but there’s an inside and outside window and it is pretty hard to get to both, so it’s kind of a frustrating thing to manage throughout the day. So I added a custom ventilation system. I read some material that recommended having specific measurements for the intake/exhaust versus the space in between. I mostly picked sizes based on what I stumbled across for product. The office has 10″ x 6″ inch speediboots that go to 7″ round. I couldn’t understand how people usually went from a grill/vent/diffuser to duct. I guess they usually make their own HVAC boots. Which seems insane. Half of the speediboot transition hangs out into the basement, so I added a 2×4 wall with a layer of 1/2″ sheetrock filled with fiberglass insulation, which ended with the speediboots pretty much flush. The baffle box is made out of 1/2″ plywood and 1×1 for the inside corners. I should have bought a higher grade of plywood so it would be straighter, as the warping made it hard to be sure that all edges were tight. The box is two halves, top and bottom, with a divider in each to make the internal space U shaped. One half of each U goes into the office, the other half goes to the basement. The baffle box is filled with fiberglass insulation instead of a fancier acoustic foam to reduce echo because I have a lot of it. 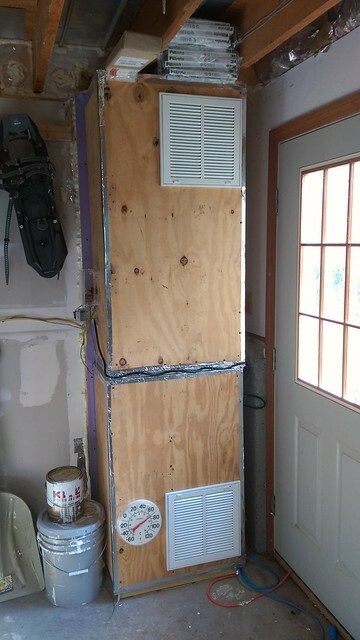 There is fiberglass screen loosely stapled over the fiberglass insulation to avoid any getting sucked off the sides. The basement side vents are 12″ x 12″ with air filters, which mostly just seemed like a good idea if I had to put in a vent anyway. My basement isn’t really musty or anything. Inside the top half is a 6″ 120VAC fan. Another piece of plywood cut with a 6″ hole makes all the air go through the fan. In the office is a 24VAC thermostat and a 120VAC fan speed control. An 120VC – 24VAC transformer provides power to the thermostat which closes a relay with a 24VAC coil that switches 120VAC to the fan speed control and then to the fan. The basement stays about 70 degrees on summer days, so the office thermostat is set to about 75. The fan speed switch is mostly because I wasn’t sure how loud/quiet the setup would be when the fan is on full blast. It has been fine. After a day of use, it has kept the office below 80, which has been pretty right. The basement humidity stays around 50%, which makes the seemingly high temperature fine. The basement has an air to water heatpump which efficiently dehumidifies too. The thermostat on my desk shows 77f with a high/low of 79/73. The fan noise doesn’t bother me, but I’m kind of OCD about it running a lot, so I probably should have gotten a digital thermostat to find the best set temperature. Eh. It’s been nicer in here on hot summer days. If it needs to be any cooler I’ll probably just stick an air conditioning unit in the basement set to 65 or so. I got up early and headed south. The trip was pretty much over, but I was still a long way from home. Given more time I would have taken the Robert Campbell highway out of Carmacks, but it was too tough for the distance I had ahead of me. I had really wanted to go up the Dempster Highway to Inuvik, and had considered it earlier in the trip after getting off of the Dalton Highway. Alas, flying out of Talkeetna had won out. I did want to head south on the Cassiar Highway though. I had skipped it while heading north and taken the entire Alaska Highway out of Dawson Creek, partially because there were reports of delays for forest fires in the northern areas of the Cassiar. A rider in Dawson City who had come up on the Cassiar had told me the road was clear now, but there were a lot of bears. I found this odd, as I had only seen a single bear on my entire trip so far. I worked my way back to the Alaska Highway and stopped for a late lunch at a familiar joint. There, a couple told me about a motorcyclist who had to be airlifted off the Cassiar a couple of days earlier after hitting a bear. I wasn’t sure what to think now. Right after I turned onto the 543mi highway, there was a large sign that reminded drivers it was illegal in British Columbia to have loaded weapons in your vehicles. This seemed quite odd, but before I could make much sense of it, I started passing bears. I saw three adults and a cub within the first 15 miles. At this point I started wondering what you do when you’re on a motorcycle and a bear in the road doesn’t want to move. You don’t have any protection. There is no reverse and you couldn’t turn around quickly on this narrow highway. I was tired and stopped for a nap at a rest area. Here I decided it would be best if I rode with some shotgun shells in my jacket pocket and kept the trigger lock off the shotgun, just in case. I hadn’t had a problem finding fuel so far, and had planned ahead for the stretch of the Dalton Highway where the distance between service stations had required more fuel than my tank would carry. I had been following the rule of filling up whenever possible, so when I found the first town around dusk, I stopped for fuel. Unfortunately they were closed, and the pumps were too old to take credit cards. I continued on, now after dark, to the next town. No joy there either. I looked at my map, did some math, and figured that with my spare fuel I could make it as far as the next service station. This next stop was a lodge for heli-skiing. Unfortunately, they were also closed. I couldn’t go any further, and it was only a few hours until morning now. I wandered around the lodge looking for a good place to lay down. Behind the lodge was a shack where the returnables were stored, and the door was covered with large spikes to deter the bears. This didn’t make me particularly comfortable, so I ended up unrolling my sleeping bag in front of the lodge and setting my alarm for 30 minutes before they opened and I slept with my shotgun that night. This entry was posted in Uncategorized on December 1, 2012 by btm. Today was filled with motorcycle stories, drinking, and games. The D2D isn’t a rally, it’s a gathering; mostly of adventure motorcycles. A small group started having a regular ride, and it grew and grew. The ride still happens, but just being in the city with everyone is really the main event. The saloon had wireless internet and beer, and I spent the whole day nearby. Occasionally I chatted with other riders, but mostly I read while uploading photos in the morning. The main entertainment is when they shut down the street outside the saloon, everyone lines up their bikes and we watch the games. How far can you ride your motorcycle while blindfolded? Can your passenger throw two water balloons over an overhead line and catch them or take a bite out of a hanging hotdog without you stopping? How slow can you ride, or how tight of a slalom can you do? It was all in good fun. 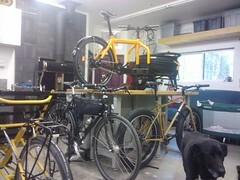 I spent some time wandering around inspecting the different bikes and their kit. I tried to get a ride on a riverboat but it wasn’t a convenient schedule, so mostly it was a recovery day. I was a day early for the Dust to Dawson events. 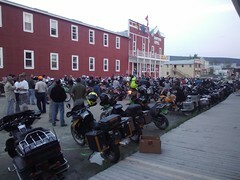 There were plenty of bikes already in town, including a few people I had met or seen over the last week in Alaska. Everyone was arriving though. I spent most of the day wandering around, exploring, and reading. 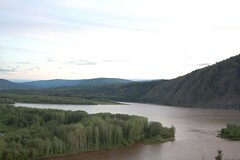 Dawson City is sandwiched between the Yukon River and the hills. There are trails up the hillside and there I went with by bear spray at the ready. You always have to assume the locals laugh at people who have any concern about bears, but these trails had no shortage of signs warning you about bears and providing recommendations for proper caution. I wandered around the communication towers at the top, and down another road where I found old cemeteries. The Royal Canadian Mounted Police had other names prior, such as the Royal Northwest Mounted Police (RNWMP). They had been sent up here during lawless days of the gold rush to create order, at a time where the really wasn’t anything in the Yukon. The river had brought riverboats full of people in search of gold and now someone had to make order out of it. The gravestones represented the RCMP’s long history here, which I found quite interesting. Also, there was a habit of planting trees on graves that seemed to have gotten eventually out of hand; some of the older sections of the cemeteries had large trees that had fallen down and broken many gravestones. I also found it interesting that many of the newer graves had many personal items around them. A bit eerie under the circumstances, but I felt compelled to completely explore the cemeteries there. I wandered the city and saw a small museum of its history. I found historic cabins that belonged to Jack London and Robert Service. Eventually I settled down by the river and spent the rest of the day reading. I finished “Double or Nothing: The Flying Fur Buyer of Anahim Lake,” a book I had picked up at a restaurant near Cache Creek, BC. The book was a collection of tales written by a man who had done many things in remote areas of Canada, including many flying tales. I started reading “Wager With the Wind,” a book about Don Sheldon, who was infamous for his flying around Denali and landing on glaciers there. Flying, of course, was a theme on this trip, as I spent a lot of time thinking about my father’s career as a airline pilot and the recreational flying we did. Its been 17 months since my trip ended. Far too long to not have finished these entries. I’ve also fixed the mileages by using a computer to correctly do arithmetic. There were other motorcycle riders camped out in Chicken; most of us were headed to Dawson City, Yukon for the Dust To Dawson “gathering.” After getting some breakfast I headed over to wait for the tiny post office to open as I had a few postcards that I wanted to mail out. Mail didn’t seem to move to frequently here. There were a couple of radio towers around the post office that indicated there wasn’t much for modern communication either. In the winter the highway isn’t maintained, so mail can only come through by plane. I chatted with the postmaster for a bit after opening and letting an older couple do their business. It turned out she was driving the ambulance I followed into Chicken from an accident the day before. Small town. Accidents are common out there it turns out, everyone goes too fast and the road isn’t all that good. Wikipedia says the road isn’t even safe enough for snowmobiles in the winter. The ‘Top of the World Highway’ isn’t just one of the most northerly highways in the world, it also runs along the tops of mountains east into Canada. Supposedly this is what it is named for, and it is simply visually stunning. All of Alaska was remote and full of vistas, but this was one of my favorite sections. Eventually I reached the customs station. It isn’t near any population centers and is a bit of a tiny village of its own. There are not any services of any kind, just enough facilities to support those that work there. It’s so small that the US and Canadian customs is in the same building. I sat on my bike and chatted with the Canadian customs officer outside for a bit. I declared the shotgun and showed him the associated paperwork. He asked me a couple questions about my ammunition location but wasn’t much interested otherwise. That immediately vibrated with me; not just the words but the sincerity with which he had said it. I had plenty of miles to think about it and I really felt like I was coming to a point in the trip where I had been out of the world for a spell, had shed enough baggage along the miles that what came next become much more clear. Just before reaching Dawson City you come to the Yukon River and must cross it on a ferry. This ferry runs constantly, back and forth across the river. As neat as it was, I had to wonder if Canada hadn’t heard of bridges yet. Though, perhaps we’re all to eager to spend money on roads and bridges in America and we should take a play out of their book. Dawson City really came to be in the midst of the Klondike Gold Rush. It maintains wooden sidewalks and old “wild west” looking buildings to this day. It would be a tourist town if not really so far away, but I don’t know what else supports it. I found the information center, some food, and headed back across the river to a park on the other side with camping sites. Naturally all the river-front sites had been taken already. Besides the obvious view, the other benefit to these sites is the wind off the water helping to disperse the flies. I fought them and set up in the walk-in sites in the middle, trying to get as much space between myself and tents. When I was a kid, my father used to fly us into camp deep in the north Maine woods in his friend’s Piper PA-12 Super Cruiser float plane. So, it was a special treat to get up this morning and fly a Piper PA-18 Super Cub on floats with Lance. The Super Cub is my kind of plane; it is simple, and capable. Developed over sixty years ago, it is still considered one of the best bush planes ever built. I hadn’t flown a float plane before, but with a couple exceptions and a few different techniques for takeoffs and landings, they fly like any other plane. We covered these, and how to determine wind on the lake from the air, then went to a few lakes to practice. The Super Cub is also very similar to the Super Cruiser of my youth, and thus evoked powerful meaning and memory. Before leaving on this trip, I spoke to my counselor about how I was struggling with the frustratingly thin and banal recommendation that I make no life-changing decisions in the wake of my fathers passing. With her usual balancing grace, she offered that death often reminds us of our own mortality, prompting a fresh look at our sometimes dusty priorities. My consistently introspective nature had already provided me with the shape of these potential life changes and part of the motivation for the trip was to provide definition to them. One of these was to get back to flying, and my experience with Above Alaska definitely laid solid groundwork. 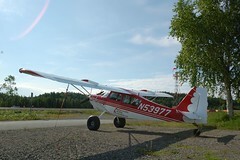 After getting back to the hanger from the lake where the Super Cub is kept, I said my goodbyes to the folks at Above Alaska Aviation. Leaving was difficult, as I was getting attached to them as well as the town, but it was time to get back on the road. 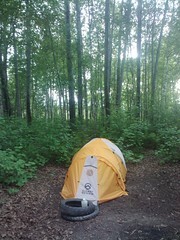 I had packed up camp and loaded the bike first thing in the morning, so I was ready to go and headed out south on the Parks highway. I stopped in Wasilla at Sportsmans Warehouse and found a great dry-bag for the shotgun to solve my issues with water getting on the firearm. I wish I had known about this product before I left. I didn’t “see Russia” while in Wasilla, but I saw plenty of pawn shops. But really it was like any other American city sprawled out around automobile use, but scaled for Alaska. After a meal I was happy to continue on out of town. From here I took the Glenn Highway to the Tok Cutoff to get back to Tok. While the later doesn’t sound like a large highway by name, it is 125 miles long. 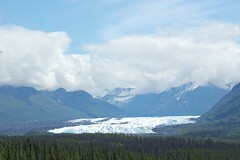 Like the rest of Alaska, the roads were lined with stunning mountain ranges to enjoy. 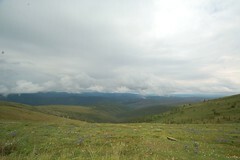 From Tok, I continued to the northeast up the Taylor and Top of the World highways. 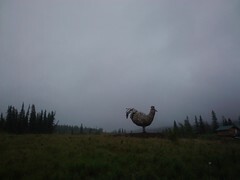 Evening found me in Chicken, Alaska, tired and hungry. The town has a little bit of an identity crisis; it appears that a couple businesses providing the same services are battling over customers with signage; but it definitely had character. After futility visiting a couple stores in town in search of hot food, I decided to set up my tent and get some breakfast in the morning. I was starting to get amused by all of these small towns having slightly different products in their gift shop. Alaska and the Yukon were full of bumper stickers that read “A quiet little drinking town with a _______ problem,” as well as an assortment of slightly different t-shirts that must have come from the same location. I mentioned the other day that my mother had remembered reading about Don Sheldon when I told her I was staying in Talkeetna. I found a copy of this book here in town, and picked up it up for when I finished reading “Double or Nothing: The Flying Fur Buyer of Anahim Lake” which I had picked up in a gift shop along BC97 somewhere. This entry was posted in Uncategorized on June 27, 2011 by btm. I had plans to fly twice more today to finish up the bush course with Above Alaska. The first flight would be upriver late in the morning to practice landing on the gravel bars. However, the cloud cover was quite low in the morning and we spent some time at Talkeetna’s FAA Flight Service Station (FSS) observing the weather report and discussing the forecast. 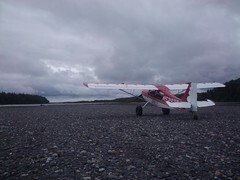 Drew of Above Alaska, was confident the weather would stay high enough for such a flight along the rivers, which convinced my instructor enough and we planned to reconvene in an hour to start the flight. The training focused on “pioneering” an airstrip; how to determine if it was long enough and good enough to land on, and then to take off from again. There is some overlap with training from other areas, but the repetition builds skill and the experience was great. Flying provides an unparalleled way to explore areas otherwise difficult to access and over the days of flying the rivers with Above Alaska they pointed out numerous amazing geographical features, such as the mighty high speed waters of Devils Canyon on the Susitna river. Later that day, when conditions improved marginally, we headed back into the mountains for our final flight. The plan was to visually navigate (all navigation is visual here) around some mountains and up some valleys to a gravel airstrip at around three thousand feet. We had a “sectional chart,” a type of aviation map, with a line drawn on it for the route to the strip to follow. My mountain training a couple of days ago was reinforced here in the tight space between the mountains on both sides of the landing strip. There was a small camp here, probably for mining, in a beautiful spot. As I retrace our route on Google Maps, I cannot underscore enough how amazing it was flying there and how poorly this is conveyed by the satellite imagery. The flight was a little eventful, carefully watching the weather ahead and behind us as to not get closed into the mountains by the clouds. Additionally, while circling the landing strip another small airplane with skis unexpectedly came down out of the mountains and flew nearby toward Talkeetna. We didn’t doddle long here, as to not give the weather more opportunity to sock us in, and were soon flying back out of the mountains into clear weather. I made the decision this evening to leave the next day and go back on the road after one more flight with Lance in the morning. This was hard, as I had grown attached to both Above Alaska and Talkeetna, however I hadn’t come to Alaska to start a new life. Not having a clear plan for flight training while I was here, I decided some more miles would do me good. I had found upon arriving in Talkeetna that the Dalton Highway had not treated my trash bag system from waterproofing my shotgun well and the barrel had picked up some rust. Unfortunately the bags held water as well as they repelled it. I dried everything out and wrapped it better with fresh garbage bags from the hardware store. I decided to ride with it atop the bike despite being a bit more obvious as to its contents and search for a better solution in the next city. This entry was posted in Uncategorized on June 25, 2011 by btm. Today began with an early flight up in Above Aviation’s Citabria and with it a new instructor. I took what amounted to their bush course. This was somewhat complicated by the fact that much of their training seemed centered around already having a private pilot certificate, which I haven’t gotten around to doing. However, this is more about having a certain amount of experience already. Since I have a fair amount, it shouldn’t really be an issue, but my new instructor was uncomfortable and unsure as to exactly what to do with me. He clearly had a lot of training, however the bush flying seemed still somewhat new to him. In all aspects of my life, I take the approach that we’re always learning and never experts, so I was aiming to grow in whatever way this unique experience would lend to me. The first flight was getting familiar with the aircraft and doing some pattern landings. These airplanes are all tail-draggers, sometimes called “conventional landing gear.” This means that they have to main wheels in the front and one pivoting wheel under the tail, as opposed to tricycle gear aircraft that that the third wheel in front of the main gear under the nose of the plane. Tailwheel landings are different than landing a typical trainer airplane, but I’ve done more than a few of them. The hardest part was getting used to the new instructor, the difference in his expectations, and how he controlled the aircraft while I was flying. This was the only instructor I’ve flown with would silently modify the controls, yet tell me to “not fight him [on the controls].” This was confusing and I left this flight at a personal low. It wasn’t just the flight though. t was Sunday and I used to talk on the phone with my father everyone Sunday afternoon. They continue to be the hardest days of the week for me in regard to dealing with his death. Additionally, it was father’s day, the first since he passed. There was no escaping the reminder of this: Above Alaska had a fathers day special, social media was full of people commenting on it, everyone at the restaurants and bars was talking about it. Finally, it was the three month anniversary of my fathers death. I put this together midday and spent some time talking it out with family. I struggled over what to do next. I stuck through, and flew the Citabria again later that day. I switched seats with the instructor, which seemed to make him more comfortable and find a bit groove for himself. 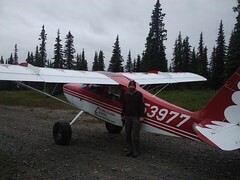 This plane has large Alaska Bush Wheels on it to aid in “off-field” landings, as well as a Short Takeoff and Landing (STOL) kit, making it particularly suited to bush operations. We went out and made some landings on gravels strips in the mountains and I had a good experience. As we departed the airplane on our first landing to look the strip over, the instructor asked if I wanted the handgun or the bear spray. He seemed less than comfortable with the revolver, which was fine with me as I had more faith in the handgun. I brought a shotgun and bear spray with me on my trip only because I couldn’t bring a concealed carry handgun through Canada. The latter would have been much more convenient to carry on the motorcycle and I would have been more comfortable knowing it was always on me. This, combined with walking around the airstrip with the instructor occasionally yelling “Hey bears!” provided a little humorous fringe to the great bear firearm debate/research the preceded my trip. I am in the “I would rather have a firearm and not need it, than need it and not have it” camp, except the shotgun is physically over-sized for motorcycle camping. The internet wasn’t much help in deciding a reasonable level of preparedness. 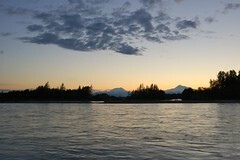 I had plans to fly with Lance from Above Alaska Aviation again in the morning, so I awoke early. 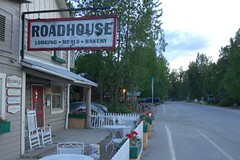 I got to the Talkeetna Road House just about when they were opening the sitting rooms for breakfast. Due to the dietary requirements of mountain climbers, they offer their plates in both a “half,” and a “full” serving. The half is plenty of food. After managing to finish this off, I awaited for their public laundry room to open officially at eight. I did some laundry, charged some devices and made some more phone calls. Lance and I took the Champ up to Denali National Park. After discussing some mountain flying techniques, we entered the Ruth Glacier and started climbing. We passed through the mile wide “Great Gorge,” supposedly one of the deepest in the world if you measure to its bottom, and came out into the Ruth Amphitheater. This is also respectfully referred to as the Sheldon Amphitheater for Don Sheldon, Talkeetna’s famous pioneering bush pilot. My mother had mentioned the evening before on the phone that she had read a book years ago, probably up north to camp, about a famous bush pilot from Talkeetna. She recalled his name, and it was the first I had heard of him. I’ll have much more to say about this later, perhaps once I get home. I wouldn’t know the full meaning of my decision to head to Talkeetna for flight training until days after I had left. However this flight was ideal. I was able to both gain some unique flying experience, and see Denali in a much more meaningful way than driving by it on the Parks highway. My mother remarked, “somehow I think your dad was your copilot.” I agree. This was exactly the kind of flying I was searching for. I had no interest in going up for a tour flight with a number of other passengers equipped to the hilt with camera equipment. A few photos wouldn’t have been bad, but I was happy to just fly. I cannot convey this passion with words, but I had no need to as I found myself here among friends. 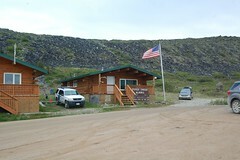 That afternoon I rode back to the road entrance to Denali National Park to take a couple of pictures and look around. There is a small village on the outskirts of the park, consisting entirely of hotels, gift shops and tour companies. I managed to find someone to print a copy of my flight logbook that I had my roommates email to me, and grab some food before heading back. This ride also added a fox to the list of wildlife I had seen along the road. Back in Talkeetna I settled in at the West Rib bar, which would become my regular evening stop when I didn’t have to get up early to fly. I had a beer and then wandered around the river bank at the summer sunset. This town was definitely growing on me.